The Padres Recoletos are reported to have introduced Christianity in the area ahead of the Jesuits, the work having been begun by Fray Nicolas de San Juan who was the visitador of Bayug Island some three kilometers east of the present Poblacion. This was in 1626. There is reason to believe, however, that the natives of Bayug(whom I suspect to be ancestors of the Higa-onons of Barangay Rogongon, this city) had their first contacts with Christianized natives with the conquest of their territory ( in all likelihood towards the end of the 16th century) by Pedro Manuel Manook, a Dapitan warrior of considerable military and navigational skills. He showed Legaspi the way to the petty-kingdoms of Luzon. Both the Jesuits and the Recoletos will later be engaged in a scandalous battle fought in ecclesiastical and governmental courts to gain control over Iligan and neighboring areas. Iligan has been traditionally used by both Spanish and American colonizers as the launching pad of their pacification campaigns against the Lanao “Moros.” Thus, for more than two centuries, Iligan was practically a garrison town defended largely by Pampango and Boholano conscripts. It is reported that at the turn of the 20th century, Iligan had a population of only 3,000. The written reports which Catholic missionaries sent yearly to their superiors during the early days of the Spanish conquistadores spell out a fairly definite history of the origin of Iligan. As a Christian settlement, Iligan’s story really goes back more than four centuries ago, shortly before Legaspi’s expedition reached the Philippines in 1565. It began in the island-kingdom of Panglao, just off the southwest coast of Bohol. At that time, most of the island of Bohol was covered by virgin forest, but Panglao was already a renowned trading center. Father Francisco Combes, the Jesuit historian, states that such was the fame of Panglao that ambassadors of princes from foreign places were sent to the island. Thus, Dapitan was founded. Here Pagbuaya, while confronted by still another threat from the Muslim king of Burnay(Borneo) encountered Legaspi’s expedition in 1565 and sealed an alliance with the Spanish conquistador. It was a pilot from Dapitan who guided Legaspi to Panglao, and thence to Bohol where the blood compact was signed with a lesser chieftain, Sikatuna. Pagbuaya’s son Manook(later baptized as Pedro Manuel Manook) sided with Legaspi and the Spaniards in their conquest of Manila; and later in the conquest of the Camarines. The same Manook subdued the village of Bayug and established it as the earliest Christian settlement in what is now the city of Iligan. Hence there is a close bond between Dapitan and Iligan, whose common roots date back to the early days of Panglao. I have not yet been able to place the date of Bayug’s Christianization. But, since the Recollects were the first missionaries assigned to Iligan before the Jesuits took over in 1639, it must have occurred about the end of the sixteenth century, contemporaneous with Surigao and Butuan, which were also under the ministry of the Recoletos. In any case Iligan’s founding as a Christian settlement would still antedate that of New York City, which was founded by the Dutch in 1626. After Manook’s death, his son-in-law Gonzalo Maglinti and grandson Pedro Cabilin(son of Maglinti and the legendary Maria Uray) carried on with similar zeal and courage. This breed of men made it possible for Iligan to endure as a Christian outpost right next to Muslim strongholds. During the period when sorties and raids by the Maguindanaos, Tausugs and Maranaos ranged as far north as Batangas and Cavite, the Iliganon held on, sustained by their faith in God and their trust in Señor San Miguel, their patron saint, around whom a host of legends have grown. In 1639, Francisco Atienza, the alcalde mayor of Caraga(Surigao area), upon the instruction of Governor General Corcuera (who had just finished a second campaign against the Maguindanao Sultan Kudarat) landed at Bayug for the purpose of conquering the Lake Lanao territory. At Bayug, Atienza met the fighting recollect priest, Fray Agustin de San Pedro, whose martial exploits had earned him the resounding appellation of El Padre Capitan. Heeding Fray Agustin’s advice and using Bayug as a staging area, Atienza, built six collapsible boats and carried it overland to Lake Lanao. In the words of Father Horacio de la Costa, ” the sudden appearance of a Spanish squadron on their Lake, capable of striking anywhere along its shores, took the wind out of any resistance the Lanao datus might have been prepared to offer. They sent envoys to Atienza and asked for terms of peace.” However, when the Spanish commander started to fortify Dansalan, the Maranaos “Infested it by land and sea and succeeded in cutting it off from its base in Iligan. Hard pressed, Atienza decided to withdraw and build his fort in Iligan instead. It was also in 1639 that the Jesuits established their mission in Iligan, replacing the Recollects. Bayug, before Manook established his Christian settlement there, was probably a Higa-onon(animist) village. At that time the Maranao numbered only about 2,000 families, most of them settled around the Lake Lanao in the hinterlands. 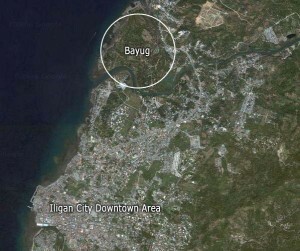 But since Balo-i(just above Iligan) was already a Muslim village(later to become one of the major principalities or pengampong of Lanao), Bayug was at least within the sphere of Muslim influence. Bayug (an island sitio of Barangay Hinaplanon, 3.7 km. northeast of poblacion) is traditionally considered as the first settlement in Iligan even in pre-Islamic times. The first settlers according to oral and textual accounts point to either the Lumads (the ancestors of the Higaonons of Barangay Rogongon, this city) or the Maranaos. Towards the end of the 16th Century, Pedro Manuel Manook (a baptized Dapitan warrior of considerable military and navigational skill who showed Legaspi the way to the petty kingdoms of Luzon-leading to the eventual conquest of Manila) subdued the village of Bayug and established it as the earliest Christian settlement in Iligan. It is interesting to note that the town of Tagoloan, Misamis Oriental is traditionally held to have been a Muslim settlement in the pre-Spanish period. Tradition has it that for some urgent reasons, Tagoloan was suddenly abandoned during a mass exodus to northeastern Lanao. The probable cause of the exodus was the unusually violent eruption of Hibok-hibok Volcano in Camiguin Island. The eruption must have been a major one accompanied by killer tidal waves, forcing the Tagoloan folks to abandon the sea in their panic. It is significant that as late as the 1950s Hibok-hibok Volcano again erupted. My theory is that the Tagoloans journeyed well into the hinterlands until they reached the area around Balo-i, in what is now Lanao del Norte, where the abundance and the easy accessibility of fresh water for their daily religious ablutions made them stay permanently. The rugged mountains and gorges of Bukidnon were not as hospitable, though nearer to Tagoloan, because water in its steep river gorges is hard to get. The tradition about Tagoloan to my thinking has factual basis. The jigsaw puzzle about the pre-Spanish origins of the Lanao Norte Muslims( I call them the Tagoloans) falls into place neatly of the assumption that they came from Tagoloan is accepted. Just one piece of evidence in support of the theory is the fact that there exists a town called Tagoloan, northeast of Balo-i, in the precise direction of Tagoloan, Misamis Oriental, I surmise that in the old days, after the passing of the generation that made the exodus from Tagoloan, that place became more and more vague, hazy memory, and the nearby area in its general direction(northeast)became Tagoloan to the later-day Maranaos. 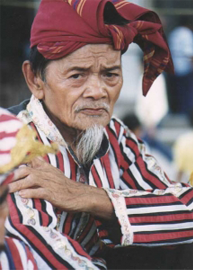 The Sultanate of Tagoloan is acknowledged by the Lake Muslims as a legitimate sultanate, not part of the traditional “pat a pengampong.” It has its own salsila (oral traditions). The poblacion of old Iligan was located west of the old public market. It is now under water. When it began to sink, Gobernadorcillo Remigio Cabili built another fort and transferred the poblacion to its present site. The gobernadorcillo at the time the Spaniards abandoned Iligan in late 1899 was the famous Hilarion Ramiro. He received the Americans under the command of a Captain John Smith who, in early 1900, landed from seven gunboats anchored in Iligan Bay…. Like the other coastal settlements, Iligan was also constantly attacked by the Muslims, a retaliatory action against the Spanish intruders. In 1639, on order of Gov. Gen. Sebastian Hurtado de Corcuera, Captain Francisco de Atienza y Vañez, a tried warrior from Toledo, Spain, constructed six collapsible boats, each capable of carrying 50 to 100 men, to be assembled at Lake Lanao. As in charge of Iligan, and after receiving suggestions from Fr. Fray Agustin(known as Padre Capitan) on the military technique and strategy against the Muslim strongholds, he led as expedition to Malanao. After the fall of Marawi to the Spaniards, the Muslims continued to harass the enemy on the sea and on land. They even cut off the supply route from Iligan, causing Atienza to pull back and fortify Iligan from the increasing Muslim attacks. Maranaos. 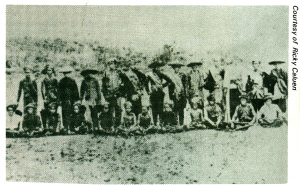 This circa 1898 photo shows several sultanes y dattos embarking on a peace talk with Spanish authorities garrisoned in Fort Victoria in Iligan. In later years, the poblacion of Iligan began to sink. Another fort was built by Gobernadorcillo Remigio Cabili and the town was transferred to its present site. After Corcuera’s rule, the Maranao were left to themselves, almost to the end of the Spanish rule. With Iligan as springboard, the Spanish troops were again sent to Marawi in 1891. Governor-General Eulogio Despujol continued the campaign to subjugate the lake region. However, it was Governor Ramon Blanco who established the Spanish power in the region. In 1895, Blanco with 5000 men under the immediate command of General Parrado, landed in Iligan and succeeded in conquering the Muslim cottas and the stronghold of Marahui, known as the strongest in Lanao. In 1896, when the Philippine revolution broke out, an insurrection also occurred in Iligan. Three years later, the gobernadorcillo abandoned the town, and Captain Hilarion Ramiro took over the reins of the government. He received the Americans forces under the command of Captain Smith who landed at Iligan in 1900. Fort Victoria, a Spanish stonefort in Iligan. It was washed away by a destructive flood in 1916. It stood on the eastern bank of the Iligan river in the general area where PNB now stands. (Reproduce in ink from an old Spanish photo by Noriel Alfonso).